And if instead biking we had to trekking/skiing/SPA-ing? You must be a member of the Padua Cycling For Fun Group to attend this activity. Would you like to join this group? ...who could be interested in a week end in Val Pusteria, this time not for biking but taking profit of winter season and all the activities that the mountain of Sudtirol is providing us? 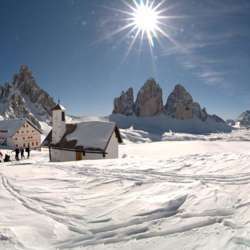 I'm coming up for the week end of 26 of January (including the nights of 25th, Friday and 26th, Saturday) with the idea to spend great time together in Val Pusteria around Dobbiaco-San Candido area! What to do over there? So, there are tastes for anyone! For sleeping the very good opportunity is provided by the Protected content in Dobbiaco, already experimented with someone of you in September when we went for biking; very nice hostel that actually is much more than a simple hostel, cheap Protected content per night included the breakfast) and comfortable! For eating on Saturday evening? Protected content booking in advance because always full! -we'll leave Friday evening (around 18: Protected content by car from Padova and all around (3 hours by car from Padua) just organising for the trip in order to use as less cars as possible! Let’s open the subscriptions ... and have hopefully for anyone, a gorgeous Protected content !